Although the name of Herman Bavinck may be unfamiliar to some readers, his labors have probably affected all those reading these lines. 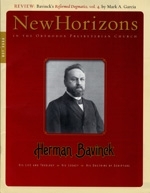 Bavinck's legacy to the Reformed world, like that of his contemporary, Abraham Kuyper, was disproportionate to the size of his native Netherlands. Herman Bavinck's magnum opus, his four-volume Reformed Dogmatics, offers a stunning synthesis of reflection upon the teaching of Scripture. It is arguably the finest multivolume Reformed systematic theology available in the English language. His theological formulations and biblical exposition are lucid and penetrating, offering stimulating insights on every topic he treats.